Figarucci Curb Chain Bracelets massiv 925 Sterling Silver! Figarucci-Curb Chain Bracelet lenght 25,0 cm with karabiner a medium-heavy silver Bracelet for men and women . Figarucci-Curb Chain Bracelet lenght 24,0 cm with karabiner a medium-heavy silver Bracelet for men and women . Figarucci-Curb Chain Bracelet lenght 23,0 cm with karabiner a medium-heavy silver Bracelet for men and women . Figarucci-Curb Chain Bracelet lenght 22,0 cm with karabiner a medium-heavy silver Bracelet for men and women . Figarucci-Curb Chain Bracelet lenght 21,0 cm with karabiner a medium-heavy silver Bracelet for men and women . 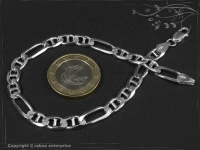 Figarucci-Curb Chain Bracelet lenght 19,0 cm with karabiner a medium-heavy silver Bracelet for men and women . 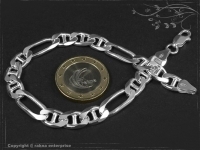 Figarucci-Curb Chain Bracelet lenght 20,0 cm with karabiner a medium-heavy silver Bracelet for men and women . Figarucci-Curb Chain Bracelet lenght 18,0 cm with karabiner a medium-heavy silver Bracelet for men and women .